A Thousand Years - the oft-requested theme song from "The Twilight Saga: Breaking Dawn"
Alleluia - uniquely beautiful song with which Larry Gatlin & the Gatlin Brothers close each concert - with their distinctive, close harmony! 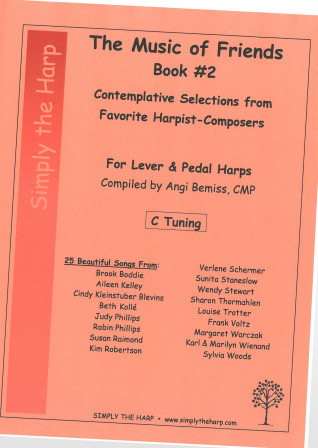 Glory Medley - includes "Open the Eyes of My Heart, Lord" & "I Bowed On My Knees and Cried 'Holy'"
The Music of Friends Book #2 - a much-requested second collection of contemplative music from my favorite harpist-composers. Gabriel's Oboe - by Ennio Morricone, from the movie "The Mission," one of the loveliest pieces ever written. Essence of "The Swan" - Balfour Knight's adaptation of the theme from Saint-Saens' "Le Cygne/The Swan." It's beautiful, and it's miraculously lever-free! The Moment - Kenny G - absolutely beautiful on the harp! The Handing Down - written by Ed Gerhard, a classical guitarist. It first appeared on the Windham Hills Guitar Sampler, and I've always wanted to play it. Wonderful Tonight - written by Eric Clapton, this one is perfect to play in many settings. Stephen Foster Collection - includes "Slumber My Darling," "Beautiful Dreamer," "I Dream of Jeanie with the Light Brown Hair," "My Old Kentucky Home," and several others - 8 familiar songs. Carol Ann - composed by Michael W Smith for piano, someone called this "elegant" when I played it recently at a music tasting. Cry Out to Jesus - by Third Day, winner of the Dove Award for song of the year. Hector the Hero - a lovely Scottish lament by J. Scott Skinner. Quiet Centre Medley - includes both "Come and Find the Quiet Centre" and "Alone Yet Not Alone."